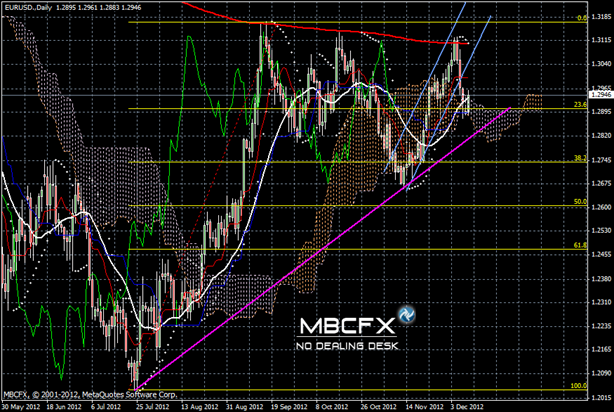 MBCFX daily Market Analysis. TODAY is Wednesday, December 11th , 2012. The Euro USD recovered as a result of the extensive sell of the US Dollar amid waiting of the investors for today Fed decisions concerning the US economic growth, the interest rate, and to renew the Twist policy to support the economy. We also notice that the prices remain steady at the 1.30 level, during the Asian trading of today ahead of the mentioned data. We can see on the 4 hours chart that the Euro USD is going to form the Head and Shoulders pattern, which is exactly like what happened in the period between October, 11th 2012 and November, 2nd 2012 , and this step finished by the drop of the Euro to the 1.2659 level. However, we are still expecting that the Euro would retreat against the dollar, and this rally is just reflecting the worry of the investors. So if the Euro USD breaches down the 1.2980 level, this would push the Euro down towards the 1.2950 level, then it will decrease to the 1.2906 level. This entry was posted in Hellotxt. Bookmark the permalink.